Someone’s got a big heart, eh? Bob Barker is funding the transportation of three elephants from the Toronto Zoo to PAWS California and it’s costing him a pretty penny. Well, if the price is right, why not? 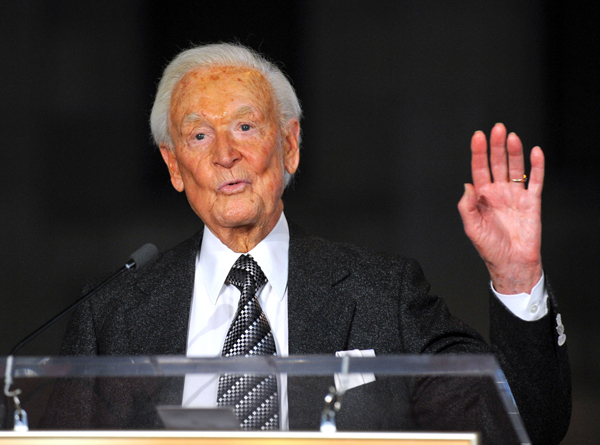 Former show host Bob Barker has generously donated $880,000 to have the Toronto Zoo elephants – Toka, Thika and Iringa – flown to the PAWS sanctuary in California. The Performing Animals Welfare Society, or PAWS, already received $300,000 from Barker to ready appropriate quarters for the animals upon their arrival. The $880,000 payment is meant to cover the costs of hiring a cargo plane to have the elephants transported; it’s now a matter of availability. “I’m very passionate about elephants and all animals … I love them,” stated Barker. It’s been a bit of a hot issue within the Toronto Zoo; the lack of funding to build a proper enclosure for these animals has led the zoo board to a vote on subsequent action. While many of the zoo staff insisted the elephants be moved to an Association of Zoos and Aquariums (AZA) supported zoo, the board voted in favour of PAWS. Which brings us to the current moment… The air flight has been deemed as the safer and less traumatic option of travel instead of trucks. And now it is a matter of arrangements. “If the Zoo and PAWS veterinarians both agree this is the safest transportation option — we are pleased that it could now also be done at no cost to taxpayers,” said zoo board chair Joe Torzsok. The elephants undoubtedly would be better off in a sanctuary, considering how underfunded the Toronto Zoo is. But one cannot help but wonder why, in a country that emphasises it’s predisposition to beautiful natural phenomena and wildlife, dedicates so little money to protecting and preserving it?